I’ve been on an even more restricted diet than usual lately and have been avoiding grains. It has been a challenge to say the least but if I have learned anything over the last few years of culinary craziness it’s this: when it comes to food (and life) where there’s a will there’s a way! Grain free, dairy free, sugar free, BUT NOT TASTE FREE! 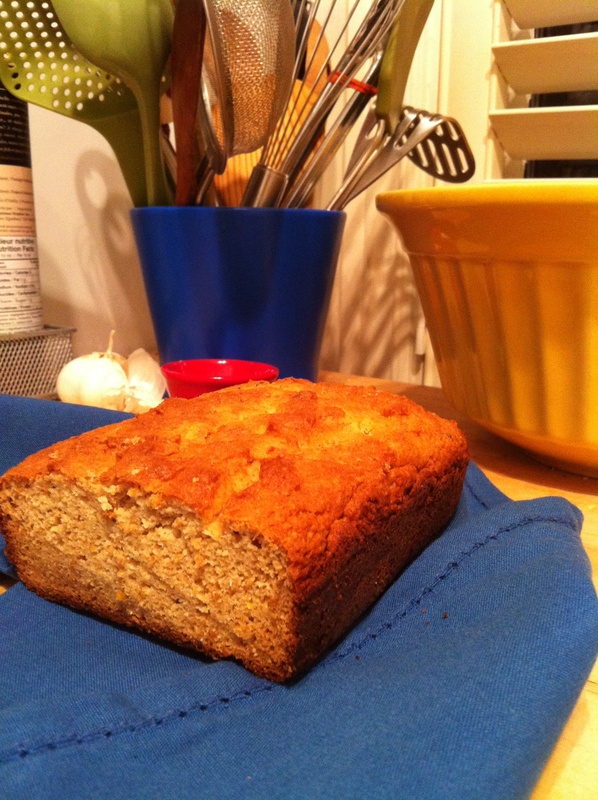 I have already made this almond flour loaf 3 times! It is simple to make and perfect for anyone on a cleanse or just wanting a healthy and satisfying treat. With almond and coconut flours, flax seeds, eggs and coconut oil, this loaf is a protein rich snack and a great source of fiber and healthy fats. The whole loaf only has 1 tbsp of honey to sweeten – the almonds make it sweet enough. And it has a buttery taste that is heavenly! Top with my other new obsession Coconut Manna for a tea time snack that will keep you smiling. The original recipe calls for 5 eggs but I replaced 2 eggs with flax seed and water to cut cost a little (1 tbsp ground flax + 3 tbsp water = 1 egg). In a bowl mix together dry ingredients (almond flour, coconut flour, flax, salt and baking soda). In a separate bowl mix together wet ingredients (eggs, oil, honey and vinegar). Grease loaf pan with coconut oil and/or line with parchment paper. This entry was posted on July 23, 2012 by katelivingfull in Savoury Recipes, Sweet Recipes and tagged blood sugar balancing, breakfast, dairy free, flax seeds, gluten free, grain free, raw honey, snackable, vegetarian.